The pumpkin. For a couple months each year the pumpkin comes out in all its glory to exclaim that fall is here. Pumpkin pie. Pumpkin Spiced Lattes. Photo props. Pumpkin picking. In my Fall 2008 wedding I even used fresh pumpkins as my centerpieces. They were used as carved out vases. Maybe my neighborhood aws the most uncreative place on planet earth, but it seems like that when I was a kid there was only one thing to do with pumpkins. Carve them with triangle eyes, a crooked toothy smile, and put a tealight inside. These days there are so many cool things to do with pumpkins! Tomorrow my family is headed to the pumpkin patch. What jazzy things will you do with your jack-o-lantern this year? ﻿Make a Festive Bird Feeder! This pumpkin bird feeder from Squidoo is adorable, and I have the perfect little tree in the front yard to accomodate such a treat. Carving a pumpkin is not only fun, but can be educational as well. The best part is, it's one of those activities in which your kids will be learning, but they'll be having so much fun that they won't know it. Have your child count out the pumpkin seeds in their jack-o-lantern. If you're carving a family of pumpkins, do a fun comparing game! How many seeds to you think the biggest pumpkin will have? The smallest? Don't throw your seeds away! Did you know that pumpkin seeds are a delicious, healthy treat? Check out this article from Self Magazine about 5 things to do with your pumpkin seeds. For the preschool or toddler in your house, pumpkin push-ins are the way to go! No knives to worry about, less messy than paint, and the parts last year after year! This Mr. 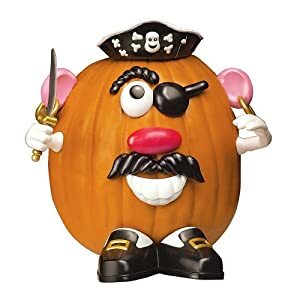 Potato Head Pirate themed push-in set runs for $11.69 on Amazon. Your trick-or-treaters will all have a giggle when they see a story being played out on your porch with pumpkins. Check out the full list of ideas at Disney's Family Fun. More and more pumpkin carving is becoming an art. My husband and I learned this when two years ago on Halloween we were in St. Lucia and entered our resort's pumpkin carving competition. Yea. . . The winning pumpkin had the Piton Mountains carved into it along with the words St. Lucia. The layers were carved so meticulously that a lit candle inside made it look exactly like the sun was setting over The Pitons. I really wish I had taken a picture of it, but in hindsight, I am still a little bit bitter. Needless to say, we know better than to enter a resort Halloween carving contest again! There are ringers out there! Check out these amazing pumpkins I found on Pumpkin Gutter. 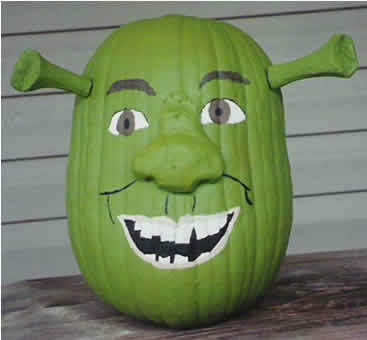 There are really so many creative ways to paint a pumpkin. I love this Shrek one that I found on Tag Yerit. Please share your pumpkin ideas with us, and send your pictures to holly@hollyatnaptime.com. LOVE the Mr. Potato Head pumpkin. Great idea. Then maybe I can find some use for those pesky Mr. Potato Head pieces that have never been used! I bought them last XMas thinking my kids would love it. Turns out I'm the only one who loves it. Great ideas! The Shrek is terrific! I am your follower. You can follow me back at http://showmemama.blogspot.com. Make sure you leave a comment so I know you visited. Wow, those pumpkins are so cool! The Mr Potato Head pumpkin is so cute but I think my favorite is the Einstein one. The detail is amazing. When I was a kid a neighbor of our's, who was an artist, always did the most amazing pumpkin carvings! Pumpkin seeds really are healthy. It's a shame how many people throw them away. I like to lightly fry them on a low heat straight from the pumpkin in a little coconut oil and tamari.